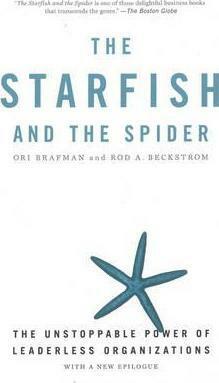 The Starfish and the Spider: The Unstoppable Power of Leaderless Organizations is written by Ori Brafman and Rod Beckström. It is a very interesting book that compare two different kind of organizations but also mentions a hybrid or combo version, best of both. Spiders are centralized, command and control, organizations. Historical examples are the Spanish army, the Aztecs and the Incas. Today most companies and organizations still work like this. Starfish are decentralized with no hierarchy and no headquarters, an open system with no designated leader. An historical example listed in the book are the Apache indians. Modern examples are Craigslist, Wikipedia, Burning Man, AA, Skype, Kazaa and open source software like the Apache server. An interesting part of the book is when they give examples of the spiders problems when they have to compete or combat against starfish. The Apache indians (starfish) managed to stand up against the Spanish army (spider) but the Incas and Azteks were spiders too and could be beaten. Todays music industry (spiders) fight against filesharing (starfish) and will most likely not win. A hybrid approach means companies gain from both world, spider as well as starfish. There are examples of companies like eBay and Amazon that decentralize customer experience. And there are centralized companies like GE that decentralizes internal parts of the business. If you want a quick look at some of what’s inside the book, see Lessons from a Starfish World. There is a booksite at The Starfish and the Spider. Wikipedia also has a page about The Starfish And the Spider. Posted on April 7, 2008 by BengtPosted in Bits and piecesTagged Books, Business, Leadership, Review.